In my younger days of partying a little too hard, I had a wonderful friend called Maurice, who would come round and look after my housemate & I when we weren’t doing a very good job of it ourselves. He would bring a can of Baxters Spicy Parsnip Soup with him, and feed us up. It became a kind of gastro comfort blanket. Fry the onion and garlic in a little oil. Add the spices and fry for a couple of minutes to release their flavours. Add everything else to the pot and bring to the boil, immediately reducing to a simmer for around 20 minutes or until the vegetables are soft. Whilst the soup is simmering, cut the crusts off the bread. Cut the slices into little dice, and shallow fry in the butter. 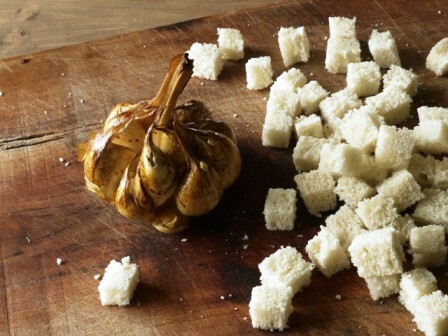 When the squares are beginning to turn golden, add 2 chopped cloves of smoked garlic to the pan and fry with the bread. Blitz the soup with a stick blender when cooked, adding as much freshly boiled water from the kettle to make it as thick as you like it. 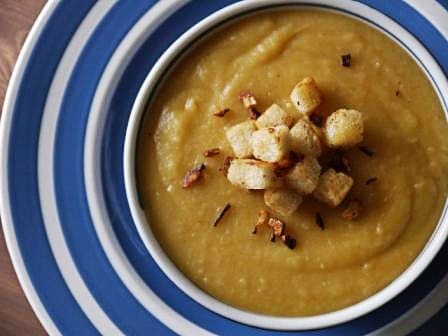 Pour into bowls and top with the yummy croutons. Edited to add; When topping up with boiled water, add 1/2 a can of coconut milk too. Wowsers! :) Thanks parlsey, he’d like that! How do you smoke your garlic? Do you do a lot at one time and store it? How do you store it? I realize I have a lot of questions but we ARE talking about GARLIC!!! Anyway, back to the garlic! I must admit to buying my garlic, pre smoked. Sorry. I will now find out how to smoke it, and shall do so on your behalf. I know there’s hot smoking & cold smoking. I think the one I bought was cold smoked as the cloves were hard and raw, whereas the hot smoked ones are mushy and well, cooked. I love parsnips and the story behind it makes it even better. Me too Christie, thanks for stopping by! Sorry to hear Maurice is no longer with us. I think it is a lovely way to honor him. I’ve always liked parsnip but other than roasted I don’t know how to cook it. Thanks so much for sharing your soup -it sounds divine! Nancy, do give it a go – I promise you won’t be disappointed! This sounds wonderful…and I do so love parsnips! Unfortunately mine didn’t germinate well this year. Now I know that they should be planted the year you purchase the seed, mine were several years old. So next spring I will definitely be planting more. Saving this recipe! Thanks for sharing on Wildcrafting Wednesday! What a shame Lisa, so often you can get away with planting old seed. Better luck next year! This sounds heavenly…. interesting spices and parsnips. I adore parsnips. Thanks so much for sharing! I found you on Wildcrafting Wedensdays! I agree, you can’t really go wrong with fresh, sweet parsnips!